Small sintering furnace is mainly used for sintering magnetic materials or electronic ceramics, is the company's fourth generation of new products. (1) Independent temperature, atmosphere and flow rate Intelligent automatic control unit, high control precision, flexible and convenient to use. (2) The computer real-time monitoring of various process parameters, so that the whole work in the best condition, friendly interface, high degree of automation, process repeatability. (3) All-ceramic fiber refractory insulation lining and efficient electric heating, energy saving than the traditional furnace 1/3. The main equipment for the round hearth lift structure, the whole body from the furnace, lifting agencies, gas systems, control cabinets and other components. Composed of ceramic fibers composite ring lining, forming a vertical cylindrical furnace. MoSi2 rod heater vertical lifting, uniformly arranged around the furnace. Furnace shell is airtight steel structure. Thermocouple from the cover down into the furnace. The lifting mechanism consists of a motor, a gear box, a transmission section, a lifting platform and the like. The hearth is placed on a lifting platform, and the hearth rises to seal with the furnace chassis using an airtight seal. Gas system to send gas, exhaust, cooling and other parts of the cycle. Gas pipeline from the gas valve, solenoid valve, flow control valve and other components. The air is regulated by the flow control valve. The adjusted gas is sent to the circulating pipe and enters the furnace from the periphery of the furnace. After the gas reacts with the workpiece in the furnace through the middle pipe, it enters the circulating cooling pipe or is discharged to the outside. Computer control panel, computer, manual / automatic selection switch, process operation indicator, fault indicator, buzzer, emergency brake button, voltage and current indication Table, temperature controller, oxygen content controller, mass flow display table, solenoid valve buttons, etc . ; control cabinet which is equipped with low-voltage electrical appliances, SCR, transformers and other power components. The machine's electrical control includes computer control, temperature control, atmosphere control, air control and lift control. They form a small DCS system. Various parts of the modular structure, structured, easy to maintain. The system uses industrial integration workstation computer. Fitted with a monitor, a standard PC / AT fully compatible film button, a 3.5 "floppy drive and on-demand feature cards in an EIA 19" rackmount chassis. Workstations for the entire closed steel structure, with dust and shock, anti-electromagnetic interference and so on. Computer on-site control level temperature controller, atmosphere controller, actuators and other real-time control and supervision to ensure that the temperature, atmosphere, flow, valve operation and other operations in time synchronization and spatial consistency. Dynamic display process parameters, process flow, alarm status and other conditions map. In addition, the computer left the host computer communication port, the other with the host computer can be far away from the equipment in the central control room to understand the working conditions of the equipment and optimize its processing. Temperature thermocouple, temperature controller, thyristor and silicon molybdenum rod heater furnace temperature closed loop control system. Temperature controller with output limiting function, according to silicon molybdenum rod heater at different temperature resistance limit output, to the temperature curve of different temperature segments to accurately adjust the temperature. Air controller, flow control valve, computer and other components of the closed-loop atmosphere control system. The air is conditioned and enters the furnace through the feed air pipe to complete the closed-loop control process, keeping the atmosphere in the furnace in line with the desired process atmosphere curve. 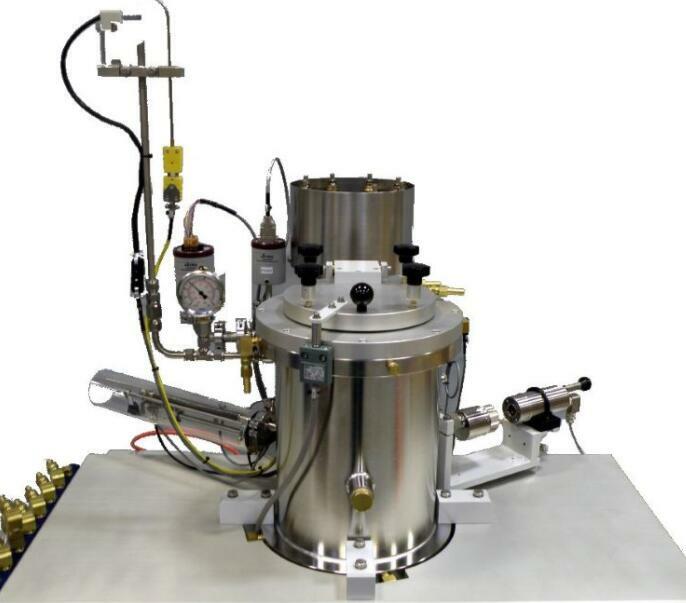 Small sintering furnace with temperature over tolerance, atmosphere over the hint; high temperature, heating over-current protection; lifting interlock protection.